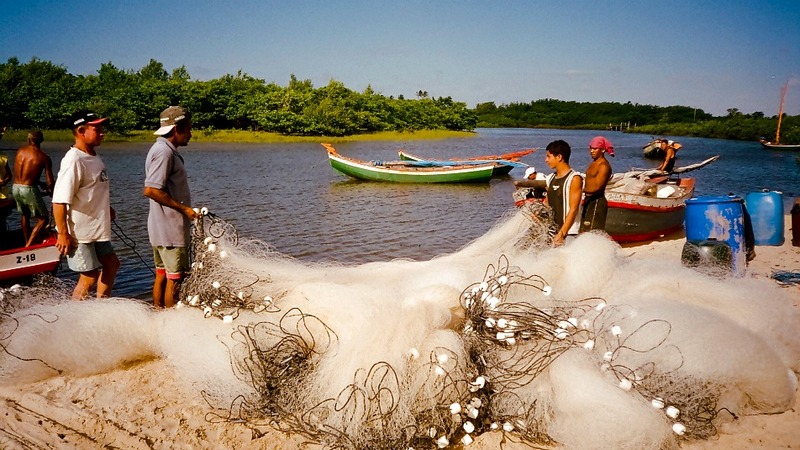 Atins is a small fishing village on the coast of Maranhão, one of Brasil’s poorest states high in the Northeast of the country. It shares about 2,000 inhabitants with its close neighbour Santo Inácio, but these are mostly well hidden. Atins is remotely tucked away in between the dunes of the Lençóis Maranhenses National Park, the delta of the Rio Preguiças and the Atlantic Ocean’s coastline, about two hours by boat or Off Road Jeep from the main town of the local municipality and transport hub Barreirinhas. The village is a vast stretch of cottages and single storey houses, sparsely lined up along a number of sand tracks just a few hundred metres recessed from the beach protecting the inhabitants from the thrust of the winds and an ever changing sandy coastline. The sandbanks sculpted by these winds and the sediments carried by the Rio Preguiças form a natural lagoon, sheltering the beaches from major swell and waves whilst providing ideal conditions for Kiteboarding. For the adventurous traveller, Atins is much better a base camp for the Lençóis Maranhenses than Barreirinhas, due to its proximity to the dunes and direct access to the sea. Whilst Barreirinhas is undergoing rapid touristic development, life in Atins remains simple. Visitors expecting levels of activity similar to perhaps Jericoacoara, a remote resemblance to a nightlife and a chance to meet dozens of fellow travellers, might be disappointed. Atins today is more like Jericoacoara, Praia da Pipa or Trancoso were about 20 years ago. The villagers make their living primarily from fishing in the sea and working the small plots of lands for a short period of time following the rainy season. Everything and everyone in Atins moves slower and so does time itself.